Yesterday brought a new Pacific Rim banner with some robot versus monster chaos in Sydney, Australia, and now a new one sheet assembles multiple Jaeger robots in the ocean, ready for some sort of big battle. The most recent bit of footage showed off more of the operators inside of these giant machines, and it's clear a lot of though went into the actual mechanics behind these giants so the drivers are not just Power Rangers getting shook around in front of a DJ console. Again, if you're seeing promos for the film and you think this is just Transformers fighting monsters, this is a Guillermo del Toro project, so give the guy some credit. Guillermo del Toro (Hellboy, Pan's Labyrinth) is directing Pacific Rim from a script by Travis Beacham. 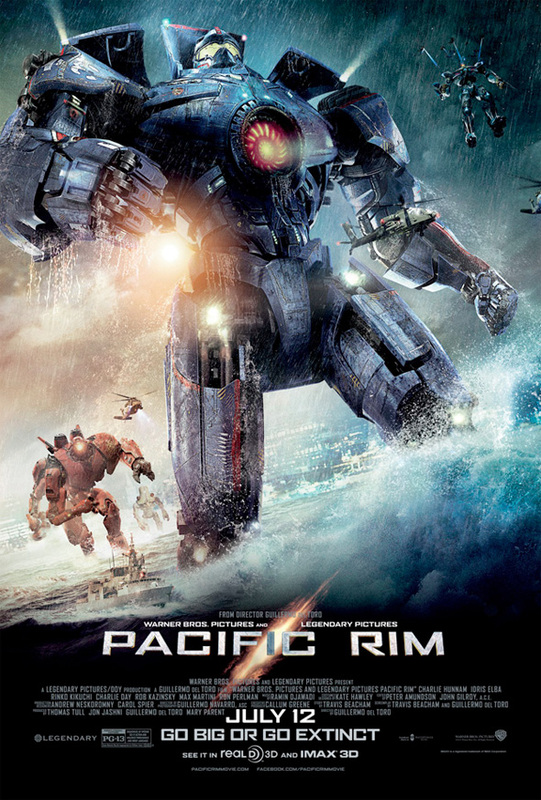 The film follows a washed up former pilot (Charlie Hunnam) and an untested trainee (Rinko Kikuchi), who are teamed to drive a legendary but seemingly obsolete Jaeger, a massive robot designed to fight legions of monstrous creatures known as Kaiju, which started rising from the sea years ago. They stand as mankind's last hope against the mounting apocalypse. The film also stars Idris Elba, Ron Perlman, Charlie Day and Clifton Collins Jr. Warner Bros will release Pacific Rim in theaters in 3D on July 12th. See the full trailer. My New Haircut Parodies Await! Looks very cool--almost like the work of Naochika Morishta or Yuuji Kaida--both of whom have done amazing artwork for Japanese mecha model kits. Anticipating this film--keeping the fingers crossed that it'll be worth it.